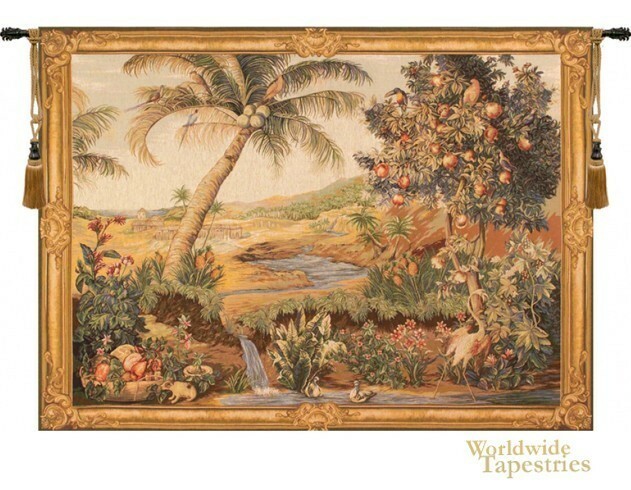 The Oasis - Horizontal tapestry is inspired form Tentures des Indes, a set of 8 tapestries woven at the Gobelins at the 17th century. Designed by Albert Echhout, this work shows the exotic flora and fauna discovered by Dutch colonies. Here we see storks, rabbits and ducks in a miraculous oasis in the desert. A palm and fruit tree are featured as is a flowing stream which leads into the small river in the foreground. This Oasis tapestry is backed with lining and tunnel for easy hanging. Note: tapestry rod and tassels, where pictured, are purchased separately.